He is a fly angler that has come to understand Tenkara through his own journey on the stream with a fly rod, just as I have. 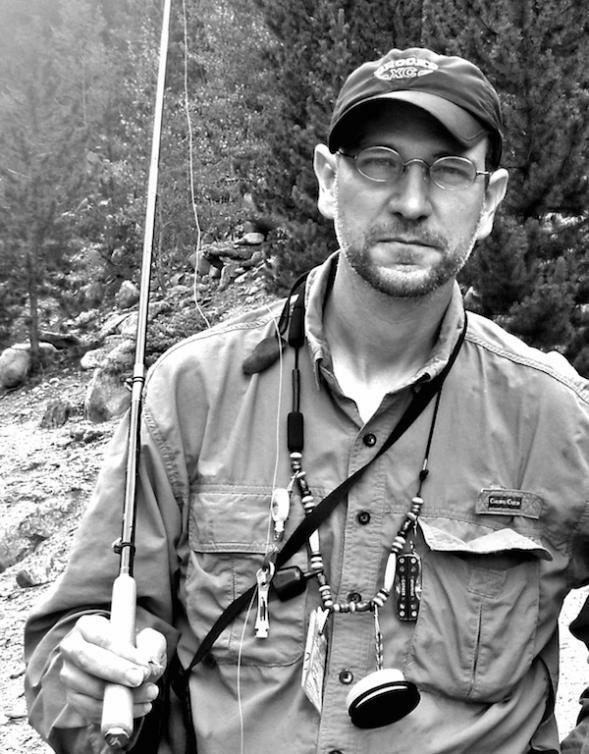 As I began to make Tenkara-Fisher and initiated the first (or earliest, or one of the earliest or whatever) American Tenkara Fly swaps, I became aware of his art work, his tying skill and his interest in the music we both enjoy. Yes, I believe we are alike and yes, we are unique as well. Our exchanges are on a slightly different level. They are nothing less than sharp and a bit intense. We know what we know and we are detail oriented. What we collectively know about fly fishing is similar and it appears that we have a great desire to know more about Tenkara. We are often found in the same areas of the Internet checking out the same things from alternate viewpoints. I enjoy Anthony’s work, it is like Tenkara. Simple but extremely effective and much deeper than what appears on the surface. Without getting into further details and spoiling it here, let’s start the Interview and learn more about Anthony Naples together. Adam: Anthony, thanks for taking this Interview. It has been a long time in the making. There have been a lot of things happening in the Tenkara community since we got started with it. As I have said, we are fly fishers before we found out about Tenkara. I have still not used a fly rod since I found out about Tenkara. It isn’t an attitude or anything like that; I just haven’t needed to shoot line. I did outfit myself with a nice 8-weight rod for fishing the Sea of Cortez and I will be doing some salt water fishing this summer and fall. Super excited to get back to it. But part of the reason why I love Tenkara so much is that I am up close to the trout and the take. It is intimate, you are right there. I am excited to be so close when they take the fly on the surface or even when nymphing, with a Tenkara rod, you are connected, the fight is telegraphed so much better. 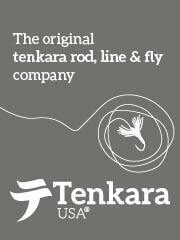 The attributes of a Tenkara rod are more connected to the fish than that of a fly rod with the tip top, guides and reel. But speaking of a fly rod and reel and beyond it to the angler using it, I think the best Tenkara Fishers come to Tenkara from a start in fly fishing. They already know and that connection is much more appreciated and the ingrained skill level tends to accelerate the control over the fly through the rod handling. Anthony Naples: Adam, first of all - thanks for taking the time and effort to do this – it’s fun to have a good discussion and I know it takes real work to do a good Q&A. I would like to preface everything by saying that I am very enthusiastic about tenkara and I happen to like writing and talking about it—but that I would never put myself forward as an expert or an authority on tenkara. I just like sharing my journey and what I’m learning along the way. Regarding the question; I think that if you come to tenkara from a stream fishing background, then yes, you’ve got an advantage at the outset. There are a lot of skills that will translate directly to tenkara. I’m mostly a small to medium-sized stream enthusiast, that’s my real fishing love (a nice bluegill pond is probably a close second). Like most I was a spin angler first – long before I was a fly angler. And I always loved small stream trout fishing. I fished as my father taught me. We used ultra-light rods, a split shot or two, and live bait, usually maggots or mealworms. We would cast upstream, dead drift the bait on a tight line and detect strikes by feel, pretty simple stuff. But it taught me the basics of what I’d need in fly fishing and tenkara. I always think of success in small stream trout fishing as being made up of 4 basic things: 1) Finding fish 2) Getting the bait/fly in front of the fish 3) Detecting strikes/setting hook 4) Stealth. Stealth being the ability to do steps 1 through 3 without spooking the fish. If you come to tenkara with stream fishing experience, be it spinning or fly-fishing, you’ve already been practicing those fundamentals – just with different tools. So with tenkara you just have to become confident and competent with using a new tool – but you already have a good idea of what you need to do. I’m not making any judgments about anybody’s tenkara skills based on whether or not they come from a fishing background. I just feel that if you’ve got that other experience then the learning curve isn’t so steep. In the long run it probably doesn’t matter – but in the beginning it helps. The person starting tenkara without a fishing or fly- fishing background can, of course, catch up. And obviously, the more you do it, the better you’ll get. 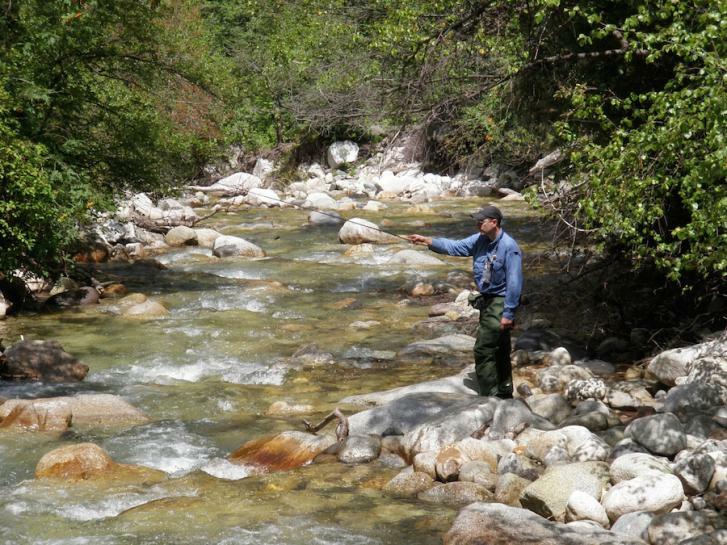 I would offer this advice to those coming to tenkara without a western fly-fishing background. If you come to tenkara without a fly-fishing background do not to ignore the wealth of western fly-fishing literature (and online content). The goals and strategies, as I described above, are all the same. I’d advise a new tenkara angler to delve into that – don’t ignore it just because it’s not called “tenkara”. Adam: At one point, I was a little mixed up about what I wanted to do with Tenkara. I knew that fly fishing worked in all mediums but did a Tenkara rod work in all waters? In my experience with it over a couple of seasons when I was questioning myself, I saw that there where others that where using a Tenkara rod (fixed line system) for bigger water and larger fish. It made me want to do it too but it made me realize that I just wanted to do it because not many people where using Tenkara rods for large fish. I was chasing that big fish again and I already did that. I’ve caught a lot of large fish on fly rods in the ocean and in large streams and rivers and I have nothing to prove to anyone. 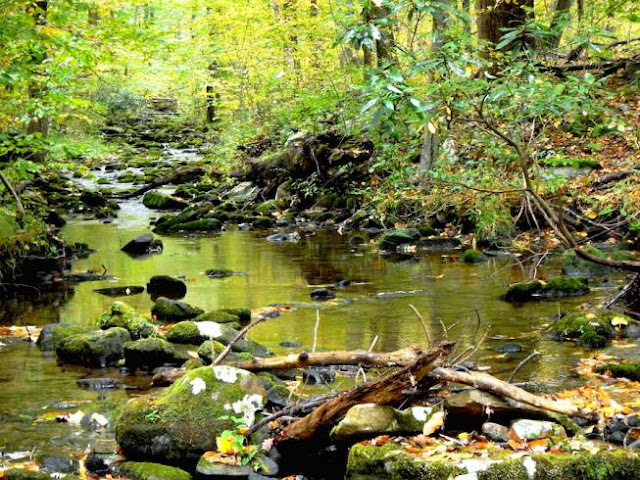 I decided NOT to go beyond Tenkara in my understanding of it, for me, it is mountain stream fishing. There are Japanese anglers that have done fixed line fishing for large fish in big rivers. And there are a lot of anglers fishing fly rods in big rivers too. Fly fishing is in the family, just a little different. It works really well. The two are closer together than they are farther apart. Anthony Naples: I came to tenkara as small stream fisherman and those small streams happen to be the kinds of places where tenkara is a comfortable fit. I know my preferences bias me, and my preferences are a function of my environment. I’m mostly interested in chasing wild trout rather than stockers, and where I live that means fishing small streams. I have loads of small wild trout streams in my neck of the woods and almost no big wild trout rivers, so I don’t fish big rivers very often. Even when I go someplace like Colorado with plenty of bigger water, I find myself looking for small streams. It’s my comfort zone. I’ve tried fixed-lines on bigger rivers from time to time, and I’m sure I’ll dabble more in the future. But I just don’t enjoy it as much as small streams. I don’t have anything against it philosophically, I just enjoy small streams more and so that’s where I spend most of my fishing time. So I guess, more than anything, I’m enamored with small streams and my tenkara follows from that. But I’m a “fish and let fish” guy. I don’t judge anybody’s fishing preferences. Quite the opposite, if someone is successful using fixed-line rods on big waters landing big fish I really respect that level of commitment and skill. If I had a wealth of quality big trout rivers near me I’d probably spend more time working on big water/big fish tenkara skills. The place that I do use tenkara in an untraditional way is on small ponds. I love stalking the shoreline of a small pond targeting panfish. I think a big bluegill on a tenkara rod is heaven. Some people dream of giant trout. I dream of giant bluegill. Adam: Let’s just say, we are on a mountain stream, wild and deep in the forest and we are fishing for brook trout. Anthony Naples: Here in southwest Pennsylvania I never get too deep in the wilderness. Often I’m fishing for a few hours then I get back to the car and hit another spot. Sometimes it’s a bit longer. I have two basic set ups. 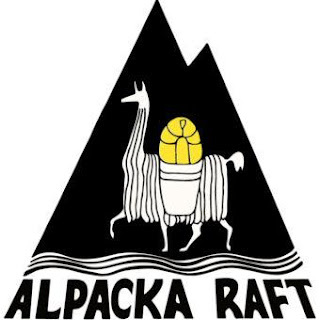 The short trip setup is usually a lanyard with tippet and nippers, pliers; a small waist pack with a waterproof camera, spare lines, small fly box, and Sawyer Mini water filter. If I’m going to be out for more than 2 or 3 hours I’ll need some lunch and coffee so in that case I’ll use a backpack. I don’t often cook streamside; I just can’t seem to get that organized. So I usually just pack a lunch and a thermos of coffee. My Zimmerbuilt pack has sleeves on the outside that can hold 4 tenkara rods, so I’ll usually bring spare rods just in case, in addition the other gear mentioned earlier. As far as flies, it varies but it’s simple. 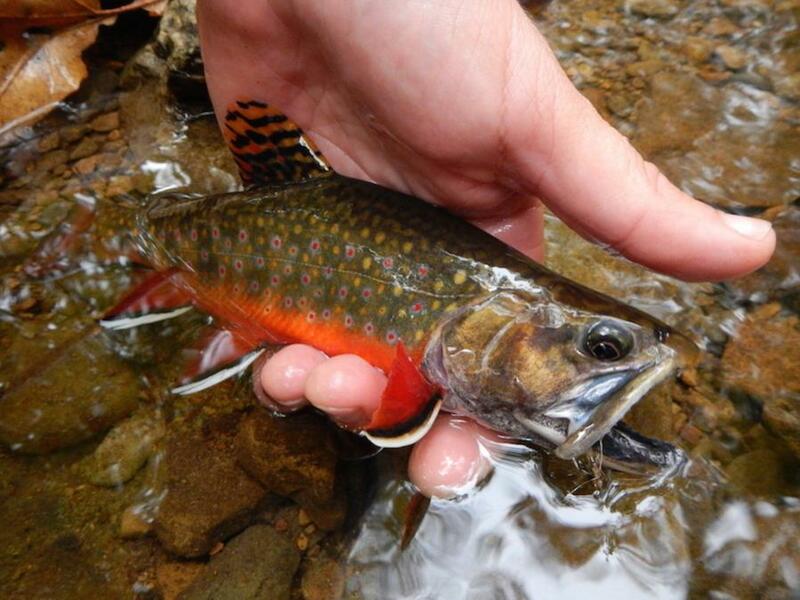 On the small brook trout streams that fish I’m pretty confident with one wet fly pattern and one dry fly pattern. More often than not the wet is a red Takayama style sakasa kebari usually tied on a Japanese size 7 or 8 keiryu hook. The dry fly is usually and Adam’s Parachute or Elk Hair caddis in size 12 or 14. I always like to have a dry fly because sometimes the fish just seem to be looking up, and I find it can be more relaxing and easier on the eyes to fish a dry. On small brushy streams (my norm) I prefer a softer rod with a full or mid-flex profile. I like the increased casting feel, slower casting stoke, and more delicate presentation possible with those types of rods. For line it’s a matching game. Ideally I match the line to the stream conditions, the rod and the fly. If it’s a more open stream with casting room then it’s a level line. Line weight depends on the rod and casting restraints. The more casting room, the lighter the line can be. But If I were forced to pick one level line weight, I could live with a #3.5. Line length for me, rarely exceeds the rod length and often it’s up to 3 feet shorter than rod length. This is all based on the tightness of streamside and overhead cover. The more cover, the shorter the line. If it’s really tight and I’m doing lots of “bow-and-arrow” style casting then I like the line plus tippet total length to be equal to rod length or even a foot shorter. I could get by with level lines and soft, full-flex rods– but sometimes it’s nice to have a light (very light) tapered line of some sort. A tapered line can roll cast, or otherwise cast without a backcast, much more easily than a level line, which is nice in tight quarters. Also, if I’m fishing dry flies I like a tapered line. A tapered line casts a dry fly much more pleasantly than a level line, especially if you want to use a long tippet. Adam: I understand that you have taken over the Oni Rod dealership in the USA. 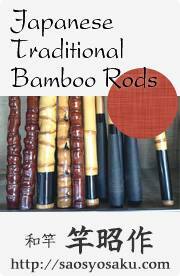 Good for you and good for Masami also good for the community, they are good rods from a Japanese master. I think you will do well in representing him. Anthony Naples: At Three Rivers Tenkara I’m currently selling the Oni Rods and the Tenkara Times rods. And though there is some variation from model to model of course, these rods tend to the soft end, full or mid-flex end of the rod spectrum. That also happens to be the kind of rod that I most like to fish. I also offer some level lines, fly boxes, line spools, hooks and a few accessories like Rising Fish Nippas and Ultralight Pliers, and Sawyer Mini water filters. I’ve recently begun selling wooden line spools and fly boxes made by Dave Burchett in Boulder Colorado. Dave’s an artistic and creative guy as well as a real craftsman so I think we’ll have fun producing creative and unique products together. We’ve already got a few new things in the works. I’ve also begun offering some of my original art – so far it’s original linocut prints, but I hope to expand to include things like photography and paintings. My other job is as a stay-at-home dad, which is an awesome job. But as someone with an engineering background, and with the kids getting older, I found myself itching for a challenge. But it needed to be compatible with my stay-at-home dad duties. I think it’s pretty common to want to be able to earn a living or at least contribute to the household (my wife is the bread winner – and makes all else possible) while doing something related to that which you love. The online tenkara shop just sort of happened—I wasn’t really looking for it. An opportunity presented itself and I just jumped off the cliff and hoped for the best. Initially the only real plan was to sell some rods that I personally liked fishing and to get them in more hands, and so play a small part in spreading the tenkara thing that I love. Three Rivers Tenkara is small compared to just about any other tenkara shop out there. Aside from continuing to offer the Oni and Tenkara Times rods, the ultimate direction isn’t totally defined at this point. I hope to continually re-focus things as I go and really find the particular niche that works best. It’s a work in progress. Adam: Very cool. I think there is room for all of us. 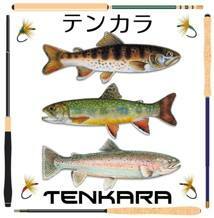 I represent Sakura Tenkara rods, as you know. I think the craftsmanship of the Seki Rei and the Kongo are in the same category as the old Oni rods. I have not seen the new “Types” but the old hand made Oni rod I had was the same sort of handmade look, very aesthetic. Anthony, my Tenkara is always evolving. At one point, I thought that if I don’t start eating some trout, I was going to stop fishing. I didn’t like the taste of fried and breaded trout and all the bones. When I learned about shioyaki from Daniel after seeing it in all the books, I finally cooked it up that way and it is delicious. It totally changes the taste and texture for the positive. Take it a step farther with some sake warmed and drop the bones in there? Whoa, nothing less than a cool fishing drinking Japanese thing. I dig that sort of thing, a fishing spirit ritual. It makes me feel much better about catch and release. It also makes me feel pretty satiated at camp and back home. My equipment is still evolving and becoming more minimal and I am diving deeper up the valley fishing much faster, sampling the stream instead of fishing every single run and pool. I’m becoming more of a hiker. I look less and less like a fisherman and more like a guy with a backpack. It’s the simplicity of Tenkara and it’s relationship with the stream as a whole. I don’t need a bunch of gear, just a small bag for my things, a rod, line and fly. I’m purposefully choosing a Japanese Tamo this year so that I don’t fall too far away from my fishing foundation. The net I have chosen is very traditional and made by an old Japanese net maker family. I’m pretty stoked about it. Again, the Japanese just knock it out of the park with a traditional Tamo. Anthony Naples: I have to admit I was never a net guy. I never use one unless I’m fishing somewhere where I’m wading deep, and can’t easily move a hooked fish to slower, shallow water and where I also expect bigger fish. Which doesn’t happen much. A net can be a real hassle when I’m bushwhacking around the tight brushy streams that I fish. Nets are always getting snagged on something. Tucking it around back doesn’t help, because I’m always ducking under deadfalls. So I usually don’t bother with a net. I will admit that there are some beautiful nets and tamo out there. But for me they’d end up being a decoration probably, a work of art more than a practical tool. Anthony Naples: I’m fan of hemostats, which I can also use to smash barbs. I’ve been thinking of getting a Ketchum Release since I’ve heard you mention them. Usually with the barbless hooks, I can get the hook out easily without any tool at all though. I love the Tenkaraman Release Net! It is a little costly for me at this point – but if anybody is looking to buy me a present that’s on the list. I still can’t believe the way the fish react – it’s like they are hypnotized. Based on his videos it seems to be very effective and fish friendly option. Adam: I’ve upgraded some of my backpacking equipment. I got a nice two person tent and a new pack. My solo tent was just too small and now if one of my son’s goes with me, there is reasonable amount of room in the tent and if I’m solo, I have a lot of room in it. Anthony Naples: I don’t. There are not many opportunities in my neck of the woods for that. I’ve done a lot of camping and fishing, but it’s always at a place where you can pull the car up. I would love to do backpacking fishing trips. I’ve got all the gear. Adam: You have children; it’s a fine line for me to take my kids fishing with me all the time. But I do take them; it’s a lesson in frustration and another one in excitement. Nothing like seeing their faces light up when they catch their first fish. Anthony Naples: Sure do, a lot. But at this point it’s mostly on ponds, sometimes bait and bobber, sometimes tenkara. I don’t usually take them on the stream for various reasons. A big reason is that I usually sneak away fishing during the week when they’re in school, as weekends tend to get busy with other activities. I have to drive several hours to get to a trout stream and it’s too much for them at this point, it’s just too long. When we’re camping near a stream, and we can do short sessions, then we’ll do that a bit. I’ve actually been watching a lot of fishing shows from the UK centered on coarse fishing with bait and I’m getting pretty excited to do more of that with the kids this season. There are places close by where we can catch carp and suckers, and catfish and even nice sized chubs. The kids would definitely be into that. Adam: I’m always intrigued by the earliest stories or memories of fishing. There is a common theme I am seeing about how people like to get back to that sort of fun that was taught early on. Anthony Naples: My father did, not fly fishing though, but fishing in general (he only got into fly fishing when I did.) He’s still one of my primary fishing companions. He grew up in family that hunted and fished. And I have a few vivid memories of fishing with my grandfather too, though I didn’t fish many times with him. Gathering grasshoppers at the pond and casting them for bluegill is one distinct memory of fishing with him. My grandfather never did get catch and release fishing though. He’d always ask us where the damn trout were when we got back from fishing, and he was seriously peeved. Every time I go fishing I carry a lot of memories to the water. And the older I get the more nostalgic I get. I really feel like I’m keeping family traditions alive. That may sound silly, but I think some of the older guys reading this will know what I mean. I eat a few trout every year for my grandfather. I’d be remiss if I didn’t mention my friend Larry. He gave me my first fly casting lesson on Spring Creek and has been my partner in crime for many hours on stream. He’s the reason I went fishing in Colorado for the first time too. Anthony Naples: Well my special stream isn’t anything like that beautiful picture that you paint. I started fly fishing while I was attending Penn State. One of Pennsylvania’s most productive limestone streams, Spring Creek, runs just miles from campus. It’s got a pastoral and wooded beauty in places, but often along its length it’s not very far from the road, and in many places it runs by houses, a few state trout hatcheries and even a waste water treatment plant. But that’s where I learned to fly fish. It’s why I learned to fly fish. There’s a lot of fly-fishing history in Pennsylvania and Spring Creek figures in that history. One of the country’s first catch and release fly fishing areas (maybe the first) was on Spring Creek and it’s still there today, Fisherman’s Paradise. When I started to realize the history of fly fishing in Pennsylvania and the part that Spring Creek had in it that’s when I first got interested in fly fishing. Fisherman’s Paradise can be tough fishing, it’s a highly pressured catch and release area and those fish have seen it all. It can be terribly frustrating at times, but also incredibly rewarding. You’ll learn a lot about presentation. If anything looks hinky the fish are not going to take. It’s quite a bit different than mountain stream fishing. And though you may not catch many fish there, as a beginner it can be a great place to learn because you can sight fish to plenty of trout. You can really lose track of time obsessing over a single feeding fish. Wading is prohibited in the portion of Spring Creek running through the Paradise area and the grounds are manicured. I imagine it’s a little bit like an English chalk stream. You don’t need to put the waders on, and with some good casting you can reach just about anywhere you need to from one grassy bank or the other. I wouldn’t want to fish there all the time, but I almost always end up there after a day of fishing other parts of the stream. It’s just relaxing to walk the banks and sight fish to feeding trout. If you get there during the sulphur hatch then you can have a sublime day of fishing. If things line up just right, you can stay in one spot and catch fish all evening. It’s pretty amazing to watch a stream come alive like that. One minute you’d swear there wasn’t a fish in the pool and the next minute it’s alive with fish. I may not make tenkara friends with this statement, but during the hatch, the fly matters. A good fly in the right size and color can make the difference between the day of a lifetime and an average day. You’ll catch some fish with a general fly, but you’ll catch loads of fish with a better match. At least that’s my experience. I’ve fished it with a generic kebari and it was less than stellar, then you switch to a sulphur emerger and it’s fish on. So that’s my special stream (and my special hatch.) Spring Creek is where I learned to fly fish and it will always be my home stream at heart. Adam: One of my favorite streams is in Colorado, just above the southern border that originates on the Continental Divide and meanders East into a large reservoir. It’s the one I told you about a couple of years ago. I’ve had one of my best days fishing there. I visited the local area fly shop the day before and heard a guide blabbing to a client about this “bikini string fly” a worm fly made of some shiny type chenille with a nice thread wrap and flame melt pointed ends. I bought a few since the guide was popular and I had checked the shop web site seeing some pretty large trout being caught in the alpine streams of the area. I approached the guide and told him about Tenkara and it was too early on for him to take it seriously. I took those bikini flys and railed ‘em. They came up out of the reservoir and stacked up and I was there and figured it out. I’ve had other bigger number days and with just as big or bigger at tail water but it was tail water and it was fly-fishing so it doesn’t count. Anthony Naples: There’s a lot of stories. But the most recent would have to be a trip last summer to the Driftless region of Wisconsin. 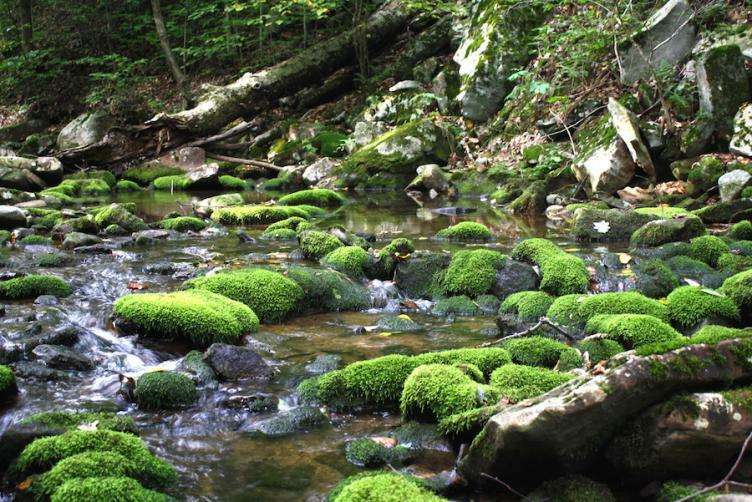 My father and I had been reading about the Driftless for years, and having fished the meadow spring creeks of Pennsylvania, and both of us being small stream fanatics, we were really intrigued by the small spring creeks of that region. The week leading up to our trip it rained, and rained, and rained. As we drove through Wisconsin on our way to Viroqua, the home base for the trip, all of the streams were full and almost overflowing, and the color of chocolate milk. When we pulled into the campground it was apparent that the stream had flooded the campground overnight, and a willow tree the size of a large house was lying in our campsite, right where our tent would have been. We had missed a drowning and/or a smashing by less than a day. We didn’t know whether it was a portent of good or bad. When we finally get to a stream, the well-known Timber Coulee, it was high and muddy. We were seriously disappointed. All the planning and driving, all the anticipation…it seemed to be in vain. With heavy hearts and with dragging feet we strung up and started fishing anyway. And then… bam! Fish on, then fish on, and then…fish on! So began three days of the best fishing I have ever had– bar none. It was bluebird skies, small meandering meadow streams, cows, sandhill cranes, mink, and hundreds of wild brown trout. I caught fish in every run and pool and riffle all day long for three days. It turns out that the high, off-color water was a blessing in disguise. Big browns were actively feeding all day long in spite of the bright blue skies. And stealth was not an issue with the high muddy water. It was perfect. The final afternoon was the cherry on top. We chose a particularly small stream on a very picturesque farm to end the trip. We started where the stream was about 8 feet across and fished upstream. It seemed that the smaller the stream got, the bigger the fish got. By the time we reached the barbed wire fence and the no trespassing sign, the stream had become small enough to straddle in spots– no joke. And the fish were still biting. Big ones. A few so large that I just couldn’t move them from the undercut banks where they sought refuge. It was a good ending to a good trip, a day I will never forget. And though we’re headed back this year, I just don’t think that first trip can ever be equaled. Adam: I still haven’t used a fly rod & reel yet since I took up Tenkara. I may not do it, I don’t know, I haven’t felt the need. I did buy that killer 8-weight rig recently for inshore and beach fishing. Whenever I wanted some big fish fight adventure, I used to go down to Mexico and fish the tides. We have a great place that I can even catch bones just 4 hours south. I can hike miles on the beach, alone catching fish that I’ve stalked or cast blindly to bait balled up with Pompano slashing through. Anthony Naples: I’d say the place that I need to get to every once in a while is central Pennsylvania. I talked about Spring Creek quite a bit in a response above. Having learned to fly fish on the limestone streams of Central PA, they will always hold a special place. Spring Creek, The Little Juniata, Fishing Creek, Falling Spring, the LeTort…and some small ones I won’t mention. I don’t get to them nearly enough. Somewhere around 1992 I was in the library at Penn State looking through issues of Trout Magazine. And there was an article about the limestone streams of Pennsylvania. I had no idea about them. I didn’t know what a limestone stream was. But these pictures…watercress, weeping willows, meadow meanderings, limestone farmhouses, it was a whole new world. These streams had wild trout. Some of the streams were world famous, and the anglers that fished there were renowned innovators. I needed to fish there. And it was pretty clear that I needed to learn to fly fish if I was going to do it right. So, now I need to get back there from time to time to get back to my fly-fishing roots. Adam: I’ve been blogging since 1996. I’ve had a web site on small stream fly fishing since then. I just learned it early on like I did in skateboarding, snow surfing, hang gliding, kite surfing and now Tenkara. I do a lot of things before anyone else and I don’t think I am special, I enjoy the things I do 100%. I’m older and have been doing it a while and I surround myself with people that are better than me and if I can’t find that group, I’m creating it. It’s going to happen, I’m driven to it and all of us are going to get better by ourselves or together or whatever but I always want to be a part of it whatever it is. My friends and competitors or the people that I am into something with help drive me to do the best that I can do. If I’m going to learn something, I’m listening if I don’t know, I’m sharing if I do, I’m a student or I’m a teacher but I’m doing it. Somewhere in there I’m participating and contributing. I’m not the only person who does things this way. In the movie about F-1 racing years of Nikki Lauda and James Hunt, Nikki touches on it about racing and the drivers he competes with. He is thankful for because it is the race and the other drivers that cause him to get better. I’m not about being better than you as in winning a race but if we are writing and doing things online representing our interests, you can bet I’m going to do the best I can do if I am involving you or if you involve me. That’s what I do. I think this Interview is a pretty good example. This is not work, I enjoy the process, it is a pleasure for me to type this out and think about you for a few hours so I hope you enjoy the process too. Anthony Naples: You’ve opened a can of worms with that question! I’ve always had an urge to create, but being mostly untrained it’s often been an urge that generally exceeds my talent and skill level. I started fly tying at the same time that I started fly-fishing. So fly-fishing from the very start was a creative outlet. Fly tying and fly-fishing are two parts of the whole and sometimes fly tying is even the bigger part of it. I can’t always get out to fish, but I can almost always find a few minutes to sit at the vise. It’s like meditation. You take all of the chaos that swirls around you and through an act of creation you turn it into neat rows of flies. It’s very therapeutic. "You know, I guess I think I've always been a professional critic, you know, or some sort of professional appreciator or something. And I just wanted to, you know, do something new, put something new out into the world, you know, kind of really put my money where my mouth is." That quote, and the idea contained within it was pretty much the kick that I needed to start actually creating. I realized that I wasn’t getting any younger and life can slip by pretty quickly. I realized that what I really wanted to do, what I needed to do, was to “…put something new out into the world…” And at the time it meant starting up a fly-fishing blog. I was finished with simply being a consumer and appreciator I was going to be a creator. I was going to put something new out into the world, regardless of whether there was an audience, regardless of whether my efforts just evaporated into cyberspace to be lost, unseen and unheard. I’d make my little paper boats, write my thoughts on them, and set them to sail down the river to their unknown fates. I started my blog, Casting Around, in March 2009. Six years later, here I am still launching boats. And interestingly, so much of what I’m involved in now, came about as a direct result of that decision. If I hadn’t started that blog, I don’t know what I’d be doing, but I guarantee it would be something completely different. I also know that without tenkara, Casting Around, and my involvement with the fly-fishing world as a creator would have died. Coming to tenkara fairly early after its major introduction to the US has fostered my creativity and fed my writing. In the beginning there just wasn’t a lot out there about tenkara in English. And much of what I did find was often not relevant to me because of a decidedly western US flavor. The high-gradient, fairly open western US mountain streams and my lower-gradient and often very tight and brushy Pennsylvania Appalachian streams are different enough that they can require different approaches and skills, and even gear. There weren’t many people talking about fishing tenkara on the tight brushy eastern US streams that I liked. So I had to figure a lot of it out through trial and error. And that’s made me very personally invested and a bit stubborn. When you come to something through a lot of self-directed, hands-on learning, you feel like you’ve earned it. That discovered knowledge has got a special value. Struggling through that tenkara learning process has been very stimulating creatively. What it allows for is for you to create your own tenkara, a tenkara that is designed for your fish, you stream environments and your preferences. You’re inventing your own tenkara. It’s beautiful. That’s what I find more interesting than anything in tenkara. I’m not very interested personally in something like “tenkara best practices”. I don’t want to see folks doing the same thing from one end of the country to the other, using the same flies, the same lines, the same techniques. That’s not very interesting to me. I want to see regionalism, quirkiness, differences. I love it when somebody does something just because they like it – not because it’s “the best way” or “the right way”. I mean it’s not rocket science, it’s not math, it’s not physics, there’s not a single right answer. To me a big part of the beauty of tenkara is that the tools are simple enough that teaching yourself is really pretty do-able. And when you have a bunch of folks teaching themselves, you have the potential to get a bunch of different but equally beautiful solutions. None of that should be taken as disrespect toward the Japanese masters. Quite to the contrary I have the utmost respect for those anglers, and I want to learn and digest as much as I can from them. But I want to do it with the goal in mind of using that knowledge as the building blocks in creating my own tenkara – not just copying their tenkara. To me, that’s a way of paying respect to those masters; taking inspiration from them rather than just imitating them. If somebody uses a fly or technique that they learned from me, that’s pretty cool. But if they were to tell me that I inspired them to make their own flies and develop their own techniques – well that would be even better. Another idea related to all that is the question of “What’s the hurry?” What I mean is, learning is the fun part for me. 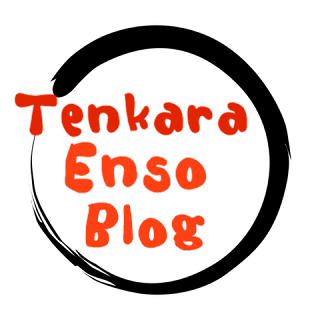 It may sound funny coming from someone that does write about tenkara from time to time. But really I think there’s a lot to be said for taking your time and messing about, ignoring the common knowledge, and only taking advice only in small chunks. For me personally, I’ve enjoyed making tenkara about the process and not the product. The only real measure of success is if I’m happy and having fun doing it. If that means re-inventing the wheel, then it’s okay to re-invent the wheel. There’s no test to take. There’s no prize for me if I master tenkara. I happen to get a lot of satisfaction from the process of learning mostly on my own rather than from “success” in catching fish. It’s nice if the two can coexist I reckon though. But if someone is struggling and frustrated and not having fun with the process then go look for resources and ask questions and get pointed in the right direction, it’s all about enjoying yourself. Adam: Thank you for your time and participation. I appreciate what you do and I hope you succeed with your goal. Life is too precious and short to wish anything less on you or anyone else. Anthony Naples: First of all, thanks to you Adam. Well, I feel like I’ve rambled quite a bit. But I guess I would like to close by saying that I would encourage folks to mess around as much as they can. Try different flies, and rods and lines and techniques. The nice thing with tenkara is that it’s pretty easy to experiment. You’ll either succeed, or partially succeed, and go back to the drawing board and even in failing you’ll have learned something valuable. I think you can learn so much by questioning everything and not simply using pre-packaged systems. Tenkara taught me that. It made me question what I’d learned from my western fly-fishing background. Much of that western background was perfectly legit, other things weren’t as solid as I may have thought. In tenkara you’ll find that there are so many different ways to do it that will work, and creating your own tenkara can be a blast.